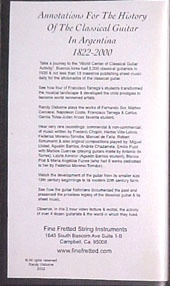 Annotations for the History of the Classical Guitar in Argentina 1822-2000 DVD $39.95 This new DVD is broken up into 24 sections. Music: 40 min., History of 51 personalities: 84 min. 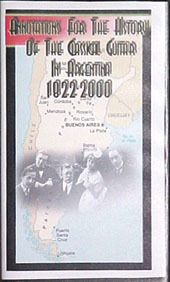 71) Lalyta Almiron's 2nd concert in the Salon "La Argentina" just 3 days later on August 22, 1924. 100) The Professors, 1924 from "Revista Tarrega"
111) Blanca Prat 1941 concert finale- "Fandanguillo"